Princess Leia and Han Solo. Aragorn and Arwen. Buttercup and Westley. 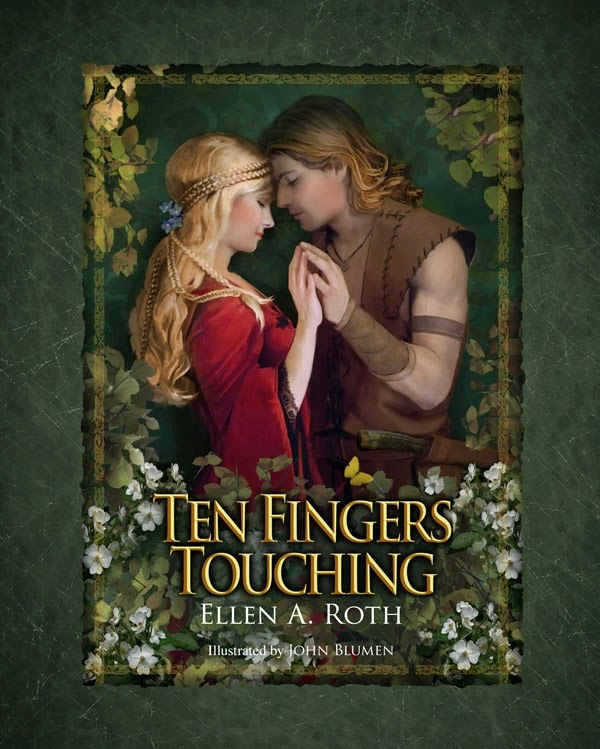 To this list of beloved fantasy couples comes Marianna and Martak in Ellen A. Roth’s timeless romantic tale of mystery and adventure, TEN FINGERS TOUCHING (February 2015; $22.95). Roth spins a passionate fable of suspense and romance illustrated with lush paintings rendered in the highest fantasy tradition by renowned artist John Blumen. Together they weave a spellbinding story of two young lovers caught between the forces of good and evil, with the future of the kingdom and an innocent child’s life at stake. Can the young master of the forest and his beloved maiden save the kingdom and find their “happily ever after?” Fans of Once Upon a Time and The Princess Bride will be swept up in this story featuring the freshest new figures in romantic fantasy literature. ELLEN A. ROTH’s TEN FINGERS TOUCHING is a true labor of love. As a child, Roth was enchanted by fairytales and spent countless hours reading and dreaming. After earning an MFA from Syracuse University, Roth moved to Pittsburgh, PA, where she worked as a registered art therapist, helping emotionally disturbed and developmentally disabled children, before earning her Ph.D from the University of Pittsburgh’s School of Education. In 1991, Roth co-founded Getting to the Point, Inc., a premier consulting firm that specializes in helping corporations attract high level executives to Pittsburgh. A member of the National Speakers Association, she has published numerous professional papers and articles. During her career, Roth has received several awards and was named one of the Best 50 Women in Business in Pennsylvania. She shares her life with her husband, Dr. Loren Roth and her children. Promo Spotlight: ACQUIESCE by Cory Cyr! Chat Wed night with Cindy Gerard! Promo and Q&A with Vivian Probst! Promo Book Tour with..... Robin Bielman! Chat Wed night with.... Vicky Dreiling! Promo Spotlight on.... Liana Brooks!